Transactional: Dues and the sale of products, services and publications generate the revenue to fund activities that advance and protect the profession as a whole. From the individual member’s perspective, however, it is still pretty much a WIITFM (“what’s in it for me?”) proposition. “Do the direct benefits I receive worth more than the money I am spending with the association?” The danger for organizations is this can degenerate into an effort to find and offer anything that members will buy, distracting the organization from its larger mission and obligation to the profession. Generative: At this stage, the association takes on ownership of authoritative knowledge for the profession, working side-by-side with the professionals it serves to develop the technical competence and expertise required for them to succeed in that market, to establish educational and ethical standards, to define and implement regulation and standards, and to foster a business environment that allows the profession to prosper and serve the public effectively. Most associations are at stage two or somewhere between stage one and two. I think it is fair to say that NSPE (in its integrated package of local, state and national membership) is solidly performing at stage two. The Scalable Association: At this stage, the knowledge and expertise particular to the association’s mission is leveraged to create value for more than just the profession who make up its membership. The association expands the stakeholder group (those who recognize that the association’s success is important to them) and increases the sources of financial and other resources that can be tapped in support of the association’s mission. They articulate a socially beneficial cause that captures the public's imagination … and support. To cite a non-engineering example, the Institute of Food Technologists (IFT) launched the Global Food Traceability Center to assist the global food industry to trace products through the supply chain to improve food safety, diminish risk, avert devastating health consequences, and economic loss to the food system. This garnered the interest (and financial support for IFT) from major players outside of IFT’s membership (including NGOs such as USAID, and corporate players, such as Monsanto and Archer Daniels Midland) who were completely aligned with the organization’s mission. A similar “grand challenge” as a feature of an association’s value proposition is not a substitute for direct member value. Individual members still need to get a direct return on their dues investment. But such a higher purpose can be the differentiating feature that permits an association to set itself apart from other sources of merely transactional benefit. After all, no association was ever founded by a group of dedicated volunteers who got together to create an organization that would be really good at selling stuff to its members. They had a higher purpose in mind. NSPE President-Elect Tim Austin, NSPE Senior Manager of Web and Social Communications Stacey Ober, and I participated in an invitation-only summit organized by Seth Kahan in March to explore this idea of tapping into a noble purpose and the opportunities it presented for NSPE. Similar teams of leaders from 22 other national associations participated, representing a wide range of professions, from geophysicists to industrial hygienists, and from nurses to entomologists. And for NSPE, we quickly realized that the scalable association Kahan talks about is what NSPE has always been: an organization that recognizes that being a licensed professional engineer means more than just holding a certificate and possessing technical competence. It is a commitment to hold the public health, safety, and welfare above all other considerations. So for us, it was not so much about finding a noble purpose as it was translating that abiding purpose that led David Steinman to first form NSPE in 1934 into terms more relevant and compelling for today. 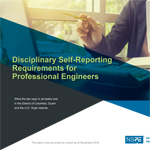 Just as the initial move to create professional licensure for engineers was motivated in the early 20th century by the tragedies that occurred when buildings or dams designed by unqualified practitioners failed, NSPE in the 21st century is committed to ensuring that developments in artificial intelligence, bio-medical devices and cyber-systems are designed with not only technical competence, but an over-riding awareness of the obligation to protect the public health, safety and welfare. We empower licensed engineers and the public they serve to ensure the ethical pursuit of innovation and technology in a manner that advances society and the common good. A first step: Engaging engineers and the public in a discussion of the ethical implications of “autonomous intelligence” (e.g. ; driver-less cars). During the group readout at the end of the day, our ideas were the only ones that provoked an audible and positive response from the other attendees. We got applause.